Besides learning Spanish (getting better every day), my first weeks in Cartagena can be captured in three words: Friendship, food and fiesta. I'll blog about all of these topics sooner or later, but I'll start with friendship for now. Up until two week ago I had never stayed at a hostel before. You know me, I don't like funny smells and those drunk backpackers seem to create quite a lot of those. On my holidays I usually traveled with someone, which made sharing a private room a better option. When on the road for work, I got to stay in (sometimes very) nice hotel rooms. Before departure my friend Sebastian told me that sleeping at a hostel is one of those things you have to have tried at least once in your life. "Bucket list it" he told me. 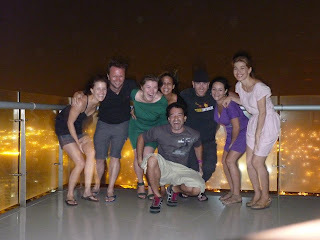 Not intending to actually put it on my bucket list, I set off for a very nice little hotel in Cartagena. I spent my first nights there while looking for long-term accommodation. As I didn't find any as fast as I'd hoped, I ended up checking into a hostel: Casa Nativa. The owners advertise it as being a calm and clean place, which it is. Not only that, it's cozy and has a great family cat. The price for a bed is higher than elsewhere so as to attract a less (smelly and) drunk crowd. Three days ago, after spending almost two weeks there, I checked out of the hostel and in to my new temporary home (a room in a fantastic apartment). With pain. Yes. I seriously liked staying at the hostel. The bunkbeds have charming curtains that provide some privacy and a big locker to store your stuff. My introduction to new people in the dorm would often be "So, I hear we're sleeping together tonight" (I know, my sense of humor is not to be appreciated by everyone). Travis' response was the best: "But we've only just met". The pros of 'sleeping together' in bunk beds definitely outweighed the cons: I have met so many interesting, fun and sweet people! It's been a great experience. I've shared the dorm with an Argentinian, a Colombian, two Canadians, an Englishman, an American and a Swedish girl. I've had huge Colombian lunches, was given a tango lesson, went dancing at cafe Havana, saw amazing sunsets on the old city wall, tried my first shots of aguardiente, was taught the expression 'se le corre el shampoo' (meaning someone is out of his mind), got to know a lot of new music, cooked an Indonesian dinner and mostly laughed a lot. The people I've met told me stories of their travels and life back home: about Parque Tayrona (which I too will visit), about Carnival in Rio, about balconies in Cuba, about the stress at their busy jobs (and leaving that job to start a hostel), about the cats that are waiting for them at home, about teaching poor women basic hairdressing skills (see cutting borders), about the experience of traveling alone, about learning languages and so much more. We've fantasized about staying here for good and starting an ice cream shop/Indonesian restaurant in one of the many houses for sale here. Some of us will stay here a bit longer and other will go back to their lives back home. I think I'm doing pretty good at crossing off items from my bucket list.